First time presented to the market for sale, this property is a tenanted investment with good returns. There is future potential to re-develop to a retail or office site with rear car parking. This is a great opportunity to own affordable Mulgrave Road real estate. Currently leased to Earlville Fish Bar which has been trading in this location for almost 40 years. 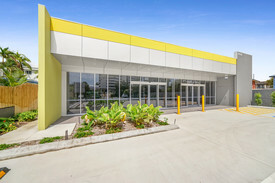 Opposite Stockland Earlville Shopping Centre this property has great exposure and has an approximate traffic count of over 36,000 cars passing daily. Cairns Airport Avenue Dev.. Price: Contact agent Helen Cross.. Opportunity For Astute In.. Price: Contact agent Scott Green..
Bungalow Industrial Wareh.. Price: Contact agent Scott Green..
Tenanted Investment/Futur.. Price: Contact agent Helen Cross.. Inner City Hair Salon And.. Price: Contact agent Scott Green.. Brand New Medical Precinc.. Price: Contact agent Scott Green.. Inner City Restaurant For.. Price: Contact agent Scott Green..
Woree Business Park Wareh.. Price: Contact agent Grant Timmi..